The sun is shining brightly! While much of the country is blanketed in snow, there is a lot of grass showing here in Minnesota. It is 21 degrees, as I type this out. * A wonderful night out with my husband Greg … Two weeks in a row! 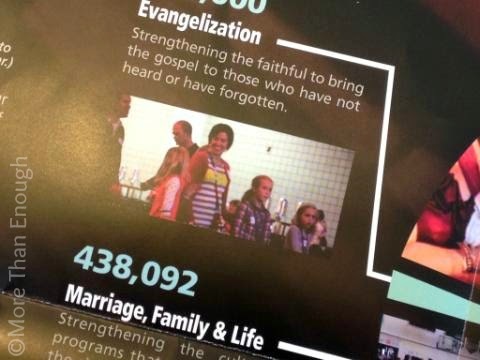 What a fun surprise to see some familiar faces when I opened up the Catholic Services Appeal brochure this morning! Fr. Moriarty, our school’s superintendent, gave us a heads-up at the school fundraising dinner on Saturday night, calling us “the poster family for the CSA.” But we really had to see it to believe it! * Whole30! I’m on Day #9. So far, so good! * How I can get my writing to be a more consistent part of my day? As well as exercise and housekeeping. I need some better routines, I think! * Lent! It’s a week away! 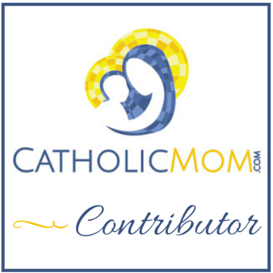 I am working on a Lenten post, which I hope to share tomorrow. * I just realized I am wearing the same outfit I wore last Monday, except for my T-shirt color! Ha! 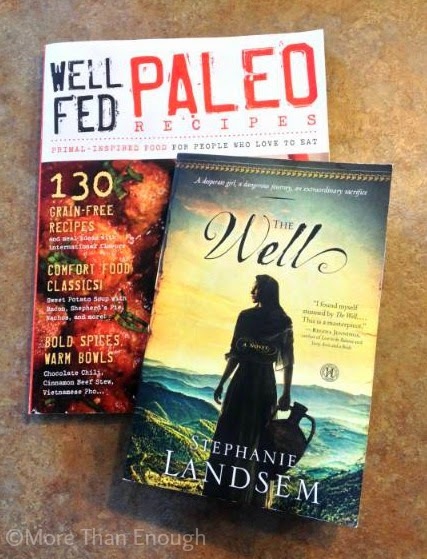 * I just finished The Well by my new friend Stephanie Landsem. It is a Biblical historical fiction novel that centers on the Bible story about the woman at the well. It is absolutely wonderful, and I highly recommend it. A full review can be found here! * It Starts With Food by Dallas and Melissa Hartwig. This is a book all about the Whole30 program, and it’s very interesting! I am reading bits and pieces when I can. * I am trying to come up with a book or two to read for Lent … Any suggestions? More Whole30 recipes. My go-to source for Whole30 recipes has been a blog called The Clothes that Make the Girl. She has authored two cookbooks, but I found a magazine of her recipes at Barnes & Noble, and that has been a wonderful resource (picture above)! Yesterday, I made her Cinnamon Beef Stew that was delicious, and I also slow-cooked some pork ribs, which I had never done before. We will enjoy those tonight. I am linking up with Jenny at The Littlest Way today! Hop on over and visit some other lovely daybooks! 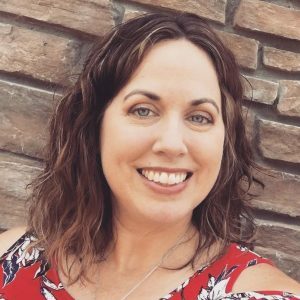 My buddy Jessica @www.goodcheapeats.com (also http://www.lifeasmom.com) is doing the Whole 30. She is sharing recipes, etc… She was on Good Morning America this morning and has FB pages. Anywhoooo… Great daybook. AND what is that lego set your adorable son has. I like that building. Thank you so much for stopping by, Em! And thank you for sharing your friend's link. I definitely will check it out! 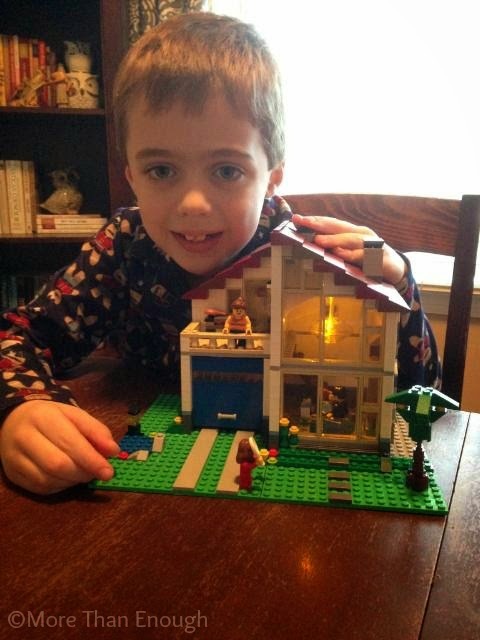 My son's Lego set is the Lego Creator Family House. It was his Christmas gift. He wanted it, because it has a brick that lights up! 🙂 The fun thing was that it was marked as a certain price at Target, and when I went to pay for it, the price was cut by 40%! I couldn't believe it! I'll have to check out the recipe you linked to. And the link provided by Emily in the comments. Looking forward to your Lent post Sarah. Yes! I cannot believe Lent is just a week away! I do not feel ready, but it helps to collect some ideas in a blog post! Hopefully, I can solidify my plans this week! Happy Whole30-ing! Glad you’re enjoying the recipes in the Well Fed magazine.